Howard Sears, of Arcadia, was on the last streetcar to run in the Foothill Cities in 1951 as a young newspaper reporter — reporting the Pacific Electric’s demise. 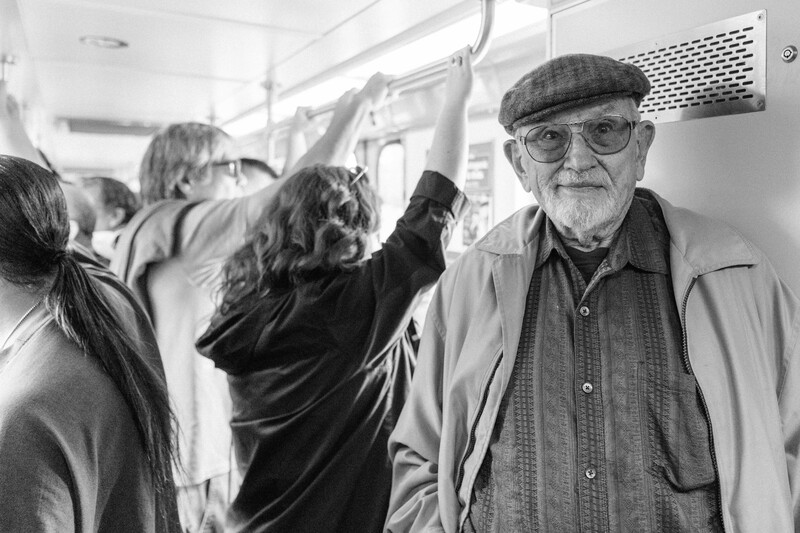 At 86, he’s back on the rails in the San Gabriel Valley. Welcome aboard, Howard. Welcome aboard, everyone. 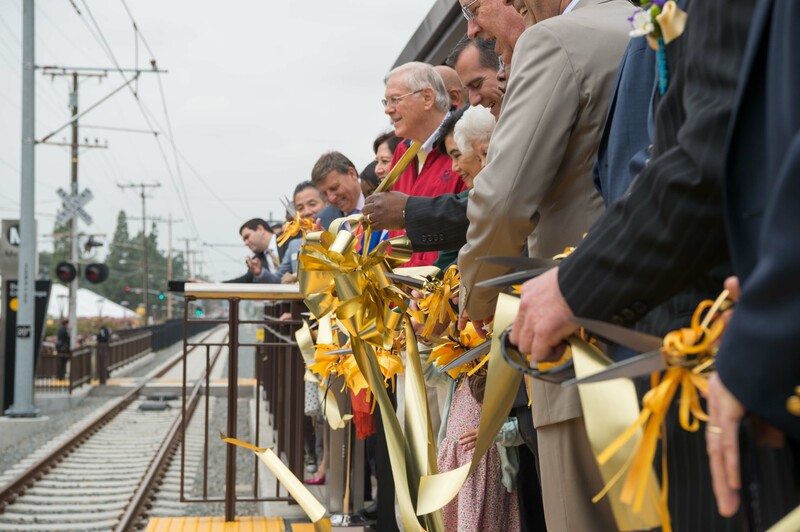 The big ribbon cutting at Duarte/City of Hope Station before trains started running. More photos below. Click to see larger versions — you may be in one of them. Metro Board Chair and Supervisor Mark Ridley-Thomas. Photo by Steve Hymon/Metro. Metro Board Member and Duarte Council Member John Fasana. Photo by Steve Hymon/Metro. First train to reach Arcadia after service began. A long-sought endorsement. Photo by Steve Hymon/Metro. Guess where he works. Hint: it’s in Arcadia, a nice walk or easy shuttle ride from the station. Photo by Steve Hymon/Metro. Not all the trains were this crowded! Photo by Steve Hymon/Metro. Photo by Peter Watkinson/Metro. Photo by Steve Hymon/Metro. Loyal Source reader Larry on an Azusa-bound train. Photo by Steve Hymon/Metro. The color guard practicing. Photo by Steve Hymon/Metro. Metro Board Members Eric Garcetti and Michael D. Antonovich. Photo by Steve Hymon/Metro. Duarte Council Member Liz Reilly and Mayor Sam Kang. Photo by Steve Hymon/Metro. The morning was devoted to the speeches and platitudes. And then, shortly before noon, the big ribbon cutting finally happened at Duarte/City of Hope Station. Yes, there were lines at the stations and a few bumps in the service because of the crowds on Saturday. But everything seemed to work out by later in the afternoon — and most people I spoke to seemed pleased that Metro Rail was extending deeper into the San Gabriel Valley. The turnout was BIG. Metro estimates at least 20,000 boardings will have taken place at the six new stations on Saturday. A huge THANK YOU to the taxpayers whose sales taxes built this project — the first to be funded by the Measure R sales tax increase approved by Los Angeles County voters in 2008. We hope that you can use and enjoy the Gold Line for many years and decades to come. A huge congratulations and thank you to my friends at the Gold Line Foothill Extension Construction Authority, whose hard work and doggedness got the project built — and finished on time and on budget. CEO Habib Balian and my cohorts in communication, Lisa Levy Buch and Albert Ho (he’s the ‘I’ in I Will Ride), have been awesome in terms of keeping the public informed as the extension took shape these past few years. Also, a nod to many colleagues at Metro in Rail Operations, Community Relations, Communications, Marketing, Creative Services and Government Relations — and anyone else I’m forgetting — who had a hand in getting service up and running and planning today’s events. Finally, for those not attendance today at the opening ceremony, more than a few elected officials said they want to see the Gold Line extended to Claremont and Montclair. The Construction Authority is already deep into the planning and design of that segment. The funding may not yet be secured, but the desire and political will sure seems to be there. Check out the Authority’s website for more info. Everything you need to know about riding the new Gold Line extension to Azusa. To download from Flickr, click on an image and then click on down facing arrow at bottom right of image and select size needed. Woo hoo! On to Cucamonga! Hi Steve — nice chatting with you on board today. Your photo of Loyal Reader Larry was the big finish to an exciting day. Thanks! You’re welcome and great to meet you! Hope you enjoyed the rides today! ROFL! Some great photos, Steve! Seriously, it reminds me of several other Metro opening days I’ve been to (say, crush loads) and why I did Not attend today! I need an excuse to visit one of the new stations after the next few days of Rain blow through …. I hope Metro learned a lesson today and will have the supplementary shuttle buses back for the opening of Expo Phase 2 and any future openings. On behalf of my colleagues who did the heavy lifting, you’re welcome! Good question on the hats. I’ll ask and see if they have any plans to sell. I know they ordered enough for staff working the event and barely had enough or ran out (I had to grovel for mine). But I’ll let my colleagues know people are probably interested. Thanks for coming out and riding yesterday! Oh well, I suppose no one really cares. I wanted to take the gold line to work today, but parking lot at APU/Citrus was already full by 7:30am. Also passed at least 8 cars looking for parking as well during the 2 minutes I was in the parking structure. I may try again tomorrow, but don’t have high hopes of this being a regular commute option for me if this is the way it’s going to be. This is why light rail is a poor option for the San Gabriel Valley. Not everyone is going to be able to drive to the station. For light rail to work, it needs to get people to and from the stations in other ways. If you want local parking for each station, Metrolink is a better option. Maybe drive down to the one on Azusa Ave.